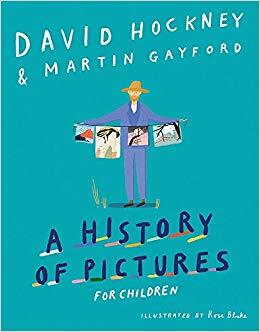 British artist, David Hockney (as I write this, one of his paintings just sold for $90.3M, a record-breaking sale for a living artist) and art critic, Martin Gayford have combined their knowledge of art in this sweeping journey through art history. From cave paintings to using computers, the pair highlights how artistic inventions throughout history created new ways of making images. The book's design is inviting and intimate. As the two men converse on their perspectives and opinions on art concepts, the font changes based on who is talking. Well-captioned reproductions of paintings discussed in the text are placed throughout the book. Hockney’s art is used to further explain a technique or invention or illustrate how it influenced his own art. To fill up the white space, Blake’s comic style illustrations further enhance the narrative. Back matter includes a timeline that highlights inventions of the art world that moves from stone tools and natural pigments used by cave painters to the use of smart phones and tablets, as well as, a glossary, endnotes, bibliography, list of illustrations, and index. We have no idea what will be next.